1. From Nagoya Station, please follow the sample train routes as show below to reach Gora Station. 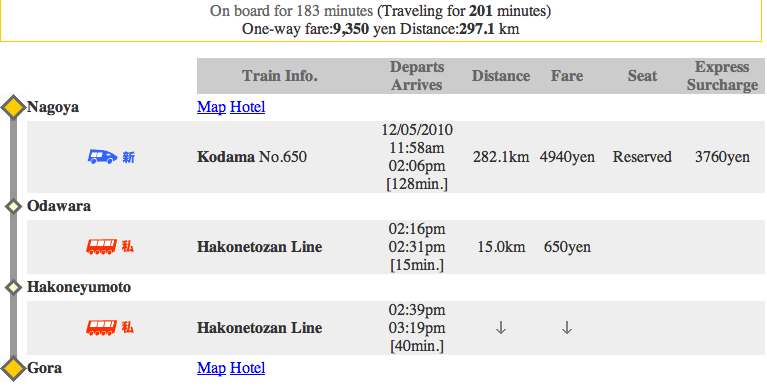 If you have the JR Pass, the fare until Odawara is covered. 2. Take the cable car from Gora station to Koenkami station (only 2 stops away) then follow the directions here: http://www.japanbooking.info/ryokan/kiritani-hakoneso/location#walking_direction to reach Ryokan Kiritani Hakoneso. **If you have a lot of luggage, you may want to consider using the "Hakone Carry Service" which delivers your luggage to Ryokan Kiritani Hakoneso from Hakoneyumoto Station. For more details please refer to the link below.